The Central Bank of Nigeria (CBN) has advised that Nigeria’s fragile growth risks falling back into recession. 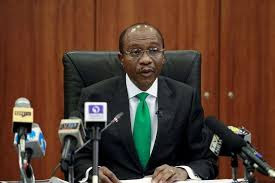 Addressing reporters at the end of the bi-monthly Monetary Policy Committee Meeting in Abuja yesterday, CBN Governor Godwin Emefiele said “forecasts of key macroeconomic indicators point to a fragile economic recovery in the second quarter of the year”. ”The Committee cautioned that this recovery could relapse in a more protracted recession if strong and bold monetary and fiscal policies are not activated immediately to sustain it,” he stressed. The Committee said it “expects that timely implementation of the 2017 Budget, improved management of foreign exchange, as well as security gains across the country, especially, in the Niger Delta and North Eastern axis, should be firmly anchored, to enhance confidence and sustainability of economic recovery”. The MPC of the CBN also expressed concern over the increasing fiscal deficit estimated at N2.51 trillion in the first half of this year. He called for “fiscal restraint to check the growing deficit” and also disclosed that the committee had once again resolved to retain lending rates at 14%. The Committee welcomed the government’s proposal to issue sovereign-backed promissory notes of about N3.4 trillion for the settlement of accumulated local debt and contractors arrears. The Committee advised the CBN “to monitor the release process of the promissory notes to avoid an excessive injection of liquidity into the system, thereby offsetting the gains so far achieved in inflation and exchange rate stability”. On why the MPC chose to retain Monetary Policy Rate (MPR) for so long, Emefiele noted that “there is a need for a low interest rate because we know that low interest rate will make it easy for people who want to borrow money to borrow at low rates, we know it will inject liquidity into the system but we are saying that inflation at 18.8% and even today at 16.1% is still considered very high in the light of studies that have been conducted”. Emefiele said the authorities “need to look at how we reverse the trend in inflation and we’re happy that we have done so from 18.8%-16.1% and we are hopeful that it will continue to trend downwards and as this is achieved, we also believe that there is a need to ease rate and also bring interest rate down”. Defending the decision to retain interest rate at 14%, Emefiele noted that “we’re truly not there yet because of the reasons I have stated but also more importantly because we believe that easing now or reducing interest rate will pull the real interest rate further into the negative territory which is a disincentive to investment”. “Those are some of the fundamental issues,” he added. A disincentive to investment, he stressed “will hurt our stability that we have so far achieved in the forex market and there is a need for us to ensure that this does not happen”. At the end of the meeting, members of the MPC resolved to retain the MPR at 14 per cent; retain the Cash Reserve Ratio (CRR) at 22.5 per cent; retain the Liquidity Ratio at 30.00 per cent; and retain the Asymmetric corridor at +200 and -500 basis points around the MPR. The Committee is satisfied with the gradual but consistent decline in inflationary pressure in the domestic economy, noting ”its substantial base effect,continuous improvements in the naira exchange rate across all segments of the foreign exchange market, and considerable signs of improved i nvestments inflow”. Emefiele said “the Committee welcomed the move by the fiscal authorities to engage the services of asset-tracing experts to investigate the tax payment status of 150 firms and individuals in an effort to close some of the loopholes in tax collection, towards i mproving government revenue”. However, the Committee expressed concern about the slow implementation of the 2017 Budget and called on the authorities to ensure timely implementation, especially, of the capital portion to realise the objectives of the Economic Recovery and Growth Plan (ERGP). Doing their work, he said “means we must do what we have done to continue to achieve the sliding trend in inflation and stabilise the forex market, that is what we are doing and we will continue to do so”. On the forex trend the CBN governor the apex bank had “left that now for the market”. “The market will decide. Gone are the days when CBN will be seen to be leaning on somebody as to whatever he thinks is the direction of the market will be,” he said. However, the CBN, Emefiele said, “remains a player and from time-to-time, given our sensitivities regarding where we think the market will be, we would intervene and that is why you are seeing the level of intervention in the last five months. The intensity of that intervention will continue”.